The south end (waiting room) of the station building survives in a car park. Part of the canopy can still be seen along the east side of the building. Notes: The first Carmarthen station opened on 1 March 1860 on the Carmarthen & Cardigan Railway's line from Myrtle Hill. The C & CR were keen to open their line in sections as it progressed north, and Carmarthen opened as a temporary terminus of a one-mile long branch from the South Wales Railway. In order to reach Carmarthen the railway had to construct a bridge over the River Towy consisting of a of a cast iron deck supported on timber piles. At an unknown date (after 1911) this bridge was replaced by more substantial structure which survived until closure of the line. The station did not remain a terminus for long as the line was extended to a new temporary terminus at Conwil on 3 September 1860. Following a dispute with the SWR over the high cost of providing the service over the new line the station closed on 31 September 1860. Having obtained their own rolling stock the C & CR reopened the station on 15 August 1861. The station had two facing platforms with the main station building on the down side (facing Newcastle Emlyn) which included a booking office, refreshment room, general waiting room, ladies’ waiting room and parcels office. An external gents’ toilet was located further south along the platform. There was a waiting room on the up platform. The platforms were spanned by a footbridge at the south end of the building. The goods yard was located on the west side, to the north of the station, and included a loading dock, 2-ton crane, two weighbridges and three loop sidings, one of which passed through a long goods shed. From the outer loop there were three further sidings, one entering a second goods shed and one serving a corn mill on the north side of Station Road. A further loop siding on the east side of the line served a saw mill. There were three engine sheds at Carmarthen (1st), all some 500yd north of the station. Two were on the north side of the line, where a one-road C & CR shed with a turntable opened on 3 September 1860. It closed in 1872 and was replaced just to the north with a two-road pitched roof, C&CR shed. The building was re-roofed in ’north light’ style (glazed panels in a saw-tooth pattern) and closed by the LMS on 4 July 1938. 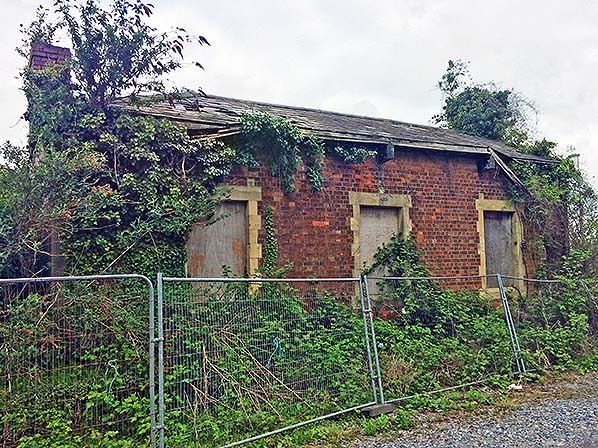 Before that, the LNWR had use of a two-road shed on the opposite side of the line opened by the Central Wales & Carmarthen Junction Railway, later absorbed by the LNWR and closed in April 1897. 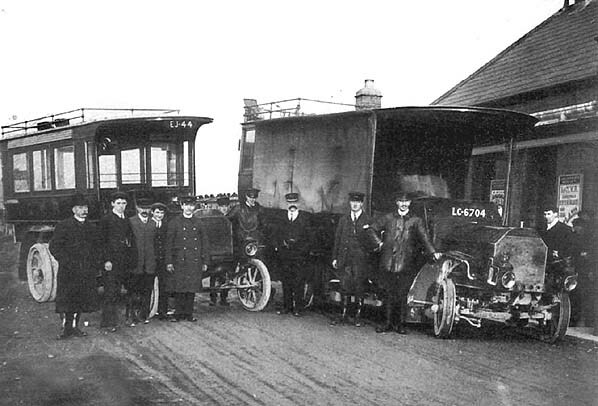 The station closed to passengers on 1 July 1902 when a new one opened 18 chains to the south of the River Towy. 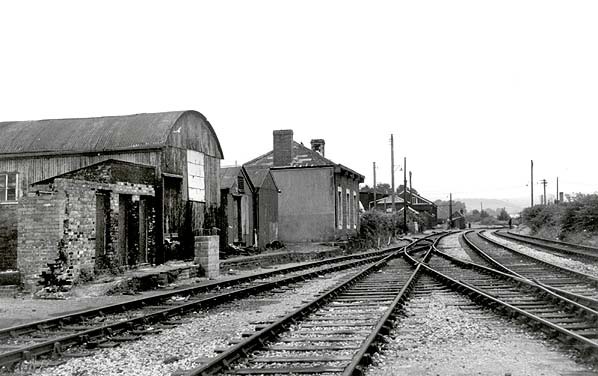 The new station did not require goods facilities as they were retained at the old station which was renamed Carmarthen Town to differentiate it from the goods station at Carmarthen Junction. The goods station remained open until the early 1980s. The main station building was intact until 1969, then the north end was demolished leaving the south end which had been the waiting room. A new end-wall and chimney were built at a later date. 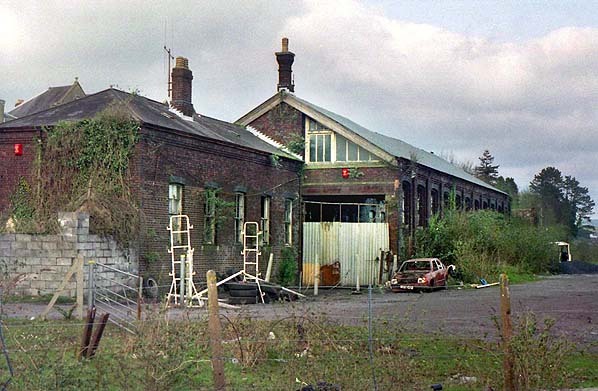 The goods shed stood until the late 1990s when the station site was redeveloped. After closure of the goods station the single-track girder bridge over the River Towy was demolished in 1983, so the Gwili Steam Railway can not rejoin the national rail network. station, and a section of the Great Northern Railway north of King's Cross together with King's Cross goods station and passenger terminus; these were all built around 1850. The line was to be constructed in two stages, with the first 18-mile section linking Carmarthen and Llandyssil. Work started a mile south of Carmarthen following the ‘turning of the first sod’ in March 1857; a junction was made with the South Wales Railway at Myrtle Hill, just north of Carmarthen station. The main engineering obstacles facing engineer Joseph Cubitt were the construction of a crossing over the River Towy at Carmarthen and the excavation of a tunnel between the valleys of Skanda Vale and Dolgran, under the Brechfa Forest south-west of Pencader. This is the only available photograph that first Carmarthen station before closure. 1888 1:500 OS town plan. 1890 1:2,500 OS map. Carmarthen's first station is seen in the bottom left corner of this map. To the north of the station a siding on the east side of the line served a saw mill and timber yard, while the goods yard was on the west side of the line. Three loop sidings are shown, with the middle siding passing through a large goods shed. From the western loop there were three more sidings, one serving a corn mill. The three engine sheds are seen in the top right corner of the map. They are, from left to right: the 1st C&CR one-road shed (1860 - 1872); the 2nd C&CR two-road shed (1872 - 1938); and the CW&CJR shed. 1906 1:2,500 OS map. Carmarthen first station is now closed, and it has been incorporated into the goods station. The platforms and footbridge have been removed but the station building can still be seen. There has been a rationalisation of the goods yard. The corn mill and saw mill have both gone, as have their sidings, The remaining sidings are largely unaltered, with two weighbridges shown and a two-ton crane on the west side of the outer loop. A siding appears to enter a second goods shed to the west of the main shed. Looking north-east at the site of the first Carmarthen station in July 1974. The building in the centre is a truncated part of the original station building. Remains of station canopy are visible on the front of building. The hipped roof of the gable-end closest to camera appears original. The small building on the left could be the gents' toilet, shown on the map below. 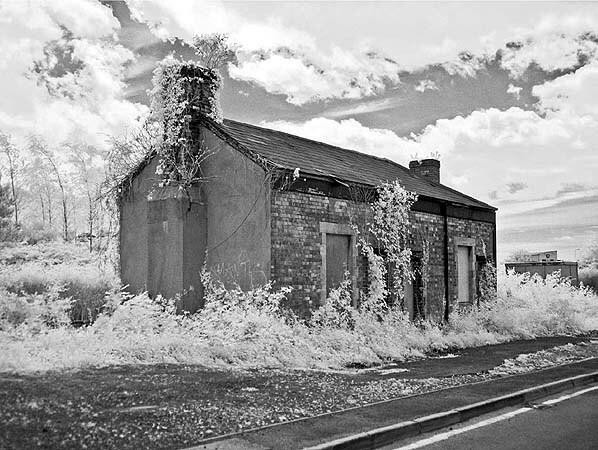 The corrugated iron buildings between station and possible urinals were used by GPO Engineers’ Department who had further premises across the road, adjacent to what was the sorting office. What appears to be part of the platform can also be seen. Carmarthen station looking north-east in April 1985. The goods shed is seen in the middle distance. 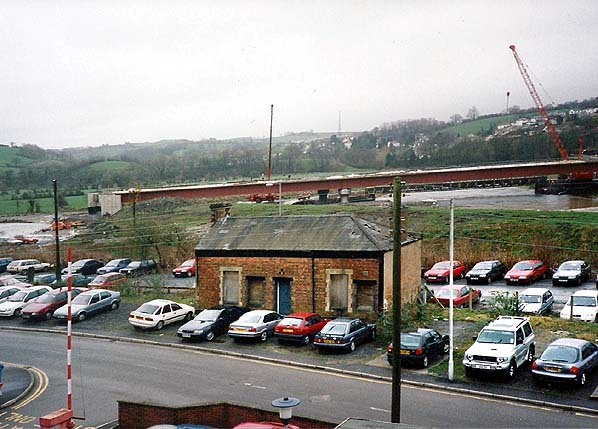 Carmarthen Town goods shed in April 1995. By 1999 the building had been demolished after redevelopment of the area around the station. 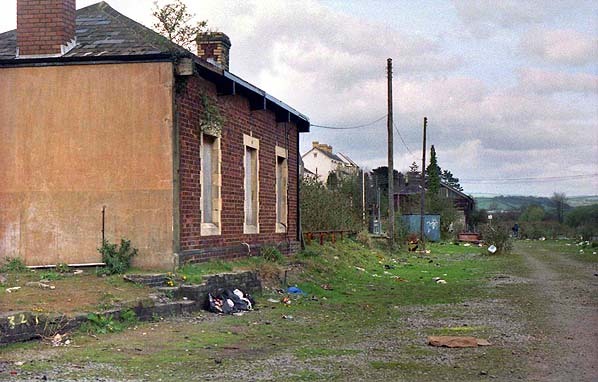 The south end of Carmarthen first station building in 1999. 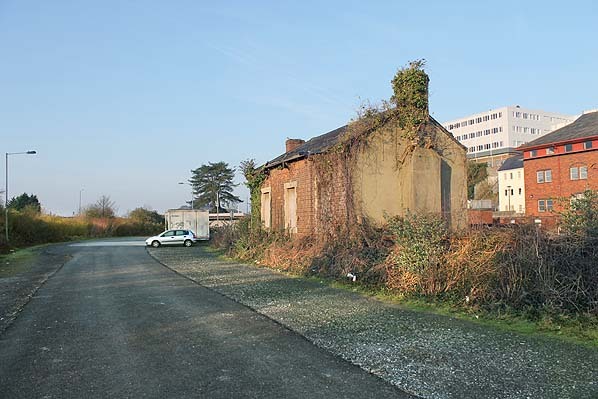 The GPO buildings have been removed, and the station building is seen from the north-west. The Carmarthen first station building is now seen with a rebuilt gable-end and a new chimney. Carmarthen first station looking south-west in March 2012. 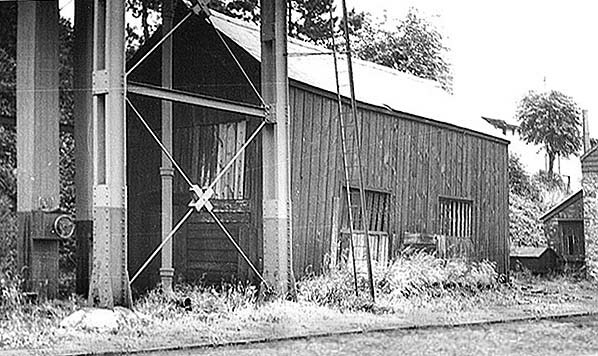 The first C&CR one-road shed in 1938. It was opened on 3 September 1860 and closed in 1872. 1888 OS 1:500 Town Plan. The 1st C&CR shed is on the left, just above the turntable; the 2nd C&CR shed is in the centre; and the CW&CJR shed is on the right. The second C&CR two-road shed in 1895. It opened in 1872 and closed on 4 September 1938. The second C&CR shed two-road shed c. 1936 after it had been re-roofed in ‘north light’ style by the LNWR. The first shed is seen on the far left. On shed, awaiting their next turn, are two Webb-designed 2-4-2 tanks. Classed 1P, these two locos were built at Crewe works by the LNWR. 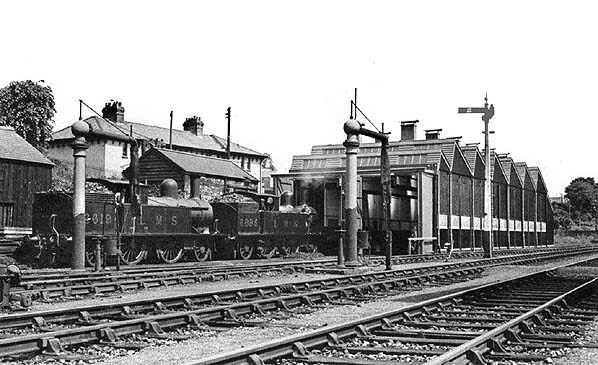 The loco on the left is 6619, built in April 1891 and withdrawn from Bangor shed in May 1947. On the right is 6695, built in April 1894 and withdrawn in October 1936. Both of these locos were scrapped shortly after withdrawal at Crewe works, and only 43 of a class of 160 passed into BR hands; none is preserved.